Before we explain what a chimney relining system is, let's learn what a chimney lining system is. 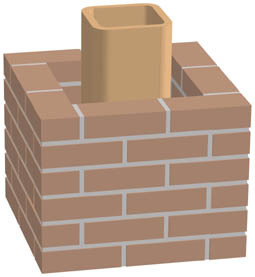 Most masonry chimneys are constructed with an inner liner of clay tiles. It's purpose is to keep the heat of flue gases inside the chimney so the chimney can't overheat the nearby combustible material, such as the framing and walls of your house, and possibly cause a fire. The liner also keeps carbon monoxide, moisture, smoke, creosote, and other products of combustion from seeping through the bricks and mortar of your chimney and leaking into your home. As you can see, a secure lining system is crucial to the safety and well being of your home and family. 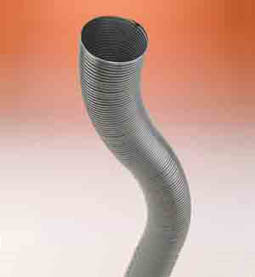 This brings us to a chimney relining system. What is it? Simple. It's a chimney liner replacement that doesn't require tearing down and rebuilding the original masonry chimney. Water damage, chimney fires, or just age can cause the deterioration of your clay liner. When that happens the National Fire Prevention Association (NFPA) code 211 says it must be replaced. The most popular, effective and economical way to reline your chimney is with UL listed, HomeSaver stainless steel relining pipe. HomeSaver has been used throughout North America since 1983 and is the industry leader.